I am a small farmer living alone in my village, Lakshmanpur (in Balrampur district of central Uttar Pradesh). My sons have migrated to Meerut city for work and at this age I cannot till my traditional land anymore. It also gets lonely here without my sons but I have my cow Gauri for company. She gives ample milk to allow me a modest livelihood. Gauri is like my daughter, my pride. I have tended her when she was a calf. I consider myself her father, her protector. But I dread the word gau rakshak. For, a group of complete strangers attacked me recently on the pretext of protecting my Gauri. At this age (70), can any man bear a violent physical attack from a mob? Now, I cannot think of leaving this village with my cow. This happened a couple of months ago. Gauri fell ill and I had to take her to the vet for a check-up. As I couldn’t afford a dalla (a four-wheeler cart used to transport cattle), I decided to walk the entire stretch with Gauri by my side. I started early in the morning, after taking a meal. I could have reached the vet dispensary in one day, but Gauri being unwell and slow to move, I had to break the journey into two days. At dusk, I took a halt at a bus stop of village Sarsavaan. And the next morning, I started my journey on foot again. By afternoon, as I reached Juathan Srinagar village, I noticed that I was drawing attention. People looked at me with suspicion… and exchanged words as if they had identified a criminal. 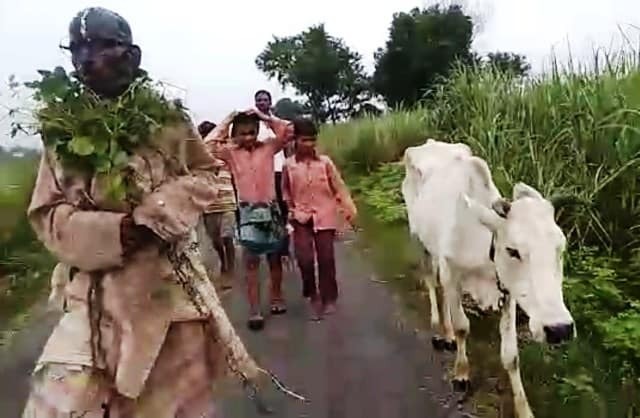 What I didn’t know then was that some local miscreants had spread the word last evening on mobile phones that they had spotted a man who was taking an old cow to a slaughterhouse for money. Amid all this minor commotion and among strangers, Gauri got nervous and freed herself to step into the nearby fields. As I followed her into the fields, I saw a couple of angry men walking threateningly towards me. Before I could ask anything, they attacked me. They used fists and legs to beat me up. I heard them accusing me of trying to sell my cow to butchers and that they would not let that happen to cows any more. They also asked me my full name and finding that I am a Hindu, they said, I deserved bigger punishment for being a Hindu and a cow killer both. I doubled over with pain but they took no pity on me. Once they had their fill, they painted my face black and put a garland of garbage around my neck and tied me up with the shackles of my own cow. Thankfully, a man informed the police and soon some cops came to my rescue. One policeman gave me an unsolicited advice: “Chacha maahaul kharab hai… akele mat nikla karo. (Bad times have befallen us, do not venture out alone with cows).” Was this is a caution or a threat? I wondered. This was the most humiliating experience of my life. My clothes torn, my face black, I walked on the road alone, but I still had my companion, Gauri, following me. She was helpless and a mute witness to my humiliation. My wife passed away 20 years ago. And in all these years, I have lived a life of isolation with no one to accompany me but my cattle. I had dedicated my life to my cows and look at the irony… I was humiliated for a cause that our chief minister, Yogi Adityanath has taken up with gusto — cow protection. An FIR has been registered and some of the ‘vigilantes’ have been arrested. But I still have one question for Yogiji. Is it a crime to serve cows? By cow protection, does he mean to punish people who have dedicated all their lives to serve cows? I know I will never get an answer.